Four years at Presbyterian College are transformative. Here, you’ll gain the knowledge and skills you’ll need to stand out from the crowd. Interested in learning more about Presbyterian College? Schedule a campus visit and tour campus. Ready to be a Blue Hose? Apply today! Presbyterian College offers undergraduate and graduate degrees. Choose from 107 majors, minors, and programs. The key to getting the most out of your four years at Presbyterian College is to get involved. Jump headfirst into the campus community and experience all the opportunities we have to offer. You play a vital role in what comes next for Presbyterian College. With your help, we can do more for our future Blue Hose inside and outside the classroom. The thought of leaving home and beginning college leaves most students feeling a little nervous. We know it may make you feel a little uneasy as well. But don’t worry. The PC campus community isn’t your typical collection of faculty, staff, and students. 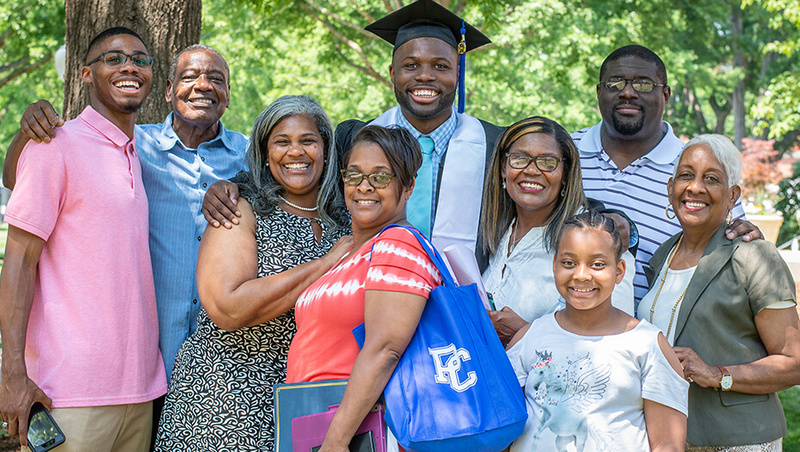 We are a family, and we want you to feel as much a part of the PC family as your student. Please use our website and the following resources as you navigate the college search. And if you have any questions, please do not hesitate to contact us – we would be happy to help! Gain a better understanding of the admission process. Meet current students and alumni on the Blue Hose Blog. Schedule a campus visit and meet the PC family. Make cents (pun intended) of the financial aid process. Learn more about the housing options available for students. Explore the various academic programs offered at PC. View our policies toward AP, IB, and AICE credits.